Disclaimer: the comments and opinions expressed in this review are the results of our own (limited!) experience with the product. As always, we try to provide context to give a fair overview of the product. We strive to remain impartial and unbiased, and we have not received any payment or compensation of any form for writing this article. 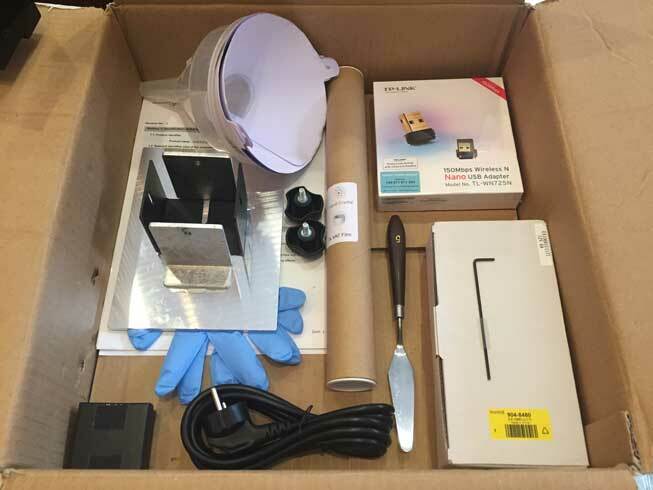 Photocentric lent us a Liquid Crystal High-Res 3D printer for free, which we returned after completing the tests for this review. Update Nov. 20, 2018: Photocentric has released a newer, upgraded version of the LC HR, the Liquid Crystal High-Res 2. The LC HR 2 has an improved drive unit, comes pre-homed, and features a flexible build plate for easier print removal. Furthermore, it comes with a new disposable vat system which eliminates the painful process of re-skinning. Photocentric now also offers a lifetime license for their Photocentric Studio software. At Machines-3D’s Machinarium 3 event, we saw a few samples from Photocentric’s new range of resin 3D printers. They were highly detailed and of great quality. Today, we are reviewing the Liquid Crystal High-Res (LCHR) made by Photocentric Ltd, a manufacturer originating from the UK. Photocentric started out by commercializing polymers for stamp-making, and a stamp-making machine known as imagepac. They now also have headquarters in the US. The beginnings of Photocentric’s daylight-activated polymer start in 2005 and 2006. However, Photocentric only really entered the 3D printer market in early 2016. Since then, the Photocentric team has won several innovation awards. Indeed, their patented DPP (Daylight Polymer Printing) technology is new, although it is similar to DLP 3D printing technology. While other resin 3D printers use a projector or laser to solidify resin, Liquid Crystal 3D printers use an unmodified LCD screen to harden the material. 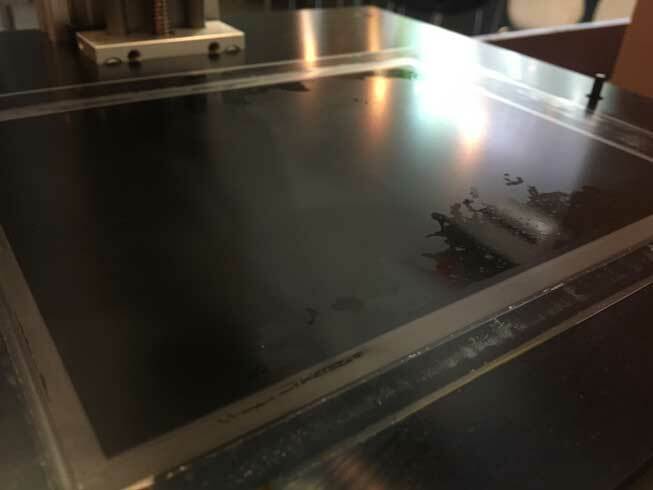 This is possible thanks to Photocentric’s highly sensitive daylight resins that require less power to cure (SLA and DLP 3D printers use UV resins). 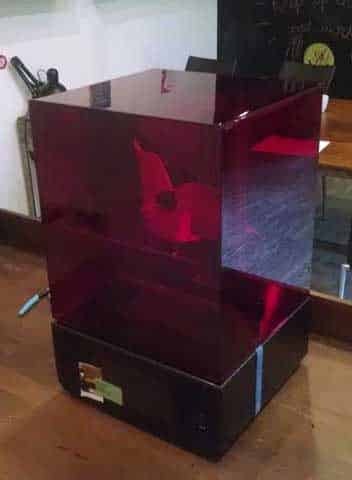 The Photocentric Liquid Crystal HR, or LC HR, is a resin 3D printer targeting professional users, but its affordable price tag of £1,599 (about $2,100) makes it accessible to advanced hobbyists as well. An important thing to point out, though, is that no matter the type of user, a dedicated and well-ventilated space is definitely a prerequisite; the vapors coming from the resin are toxic and smelly. We encountered quite a few issues while testing the Photocentric Liquid Crystal HR. Granted, it was our first test of a resin 3D printer. However, (we think) most issues were not linked to our lack of experience with DLP 3D printers. Plus, we were provided with only 1 small bottle of resin material (250g), thus preventing us from further pushing our tests and tinkering with the LC HR. 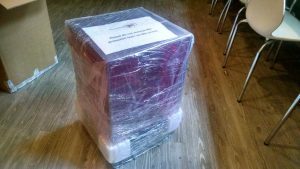 After confirmation from Photocentric that they had sent out the LC HR with UPS, the package quickly arrived to our office in Phnom Penh, Cambodia. The box is pretty tall, and a bit heavy– good thing our 3D printer testing lab is on the ground floor! Inside the big, outer cardboard box are two smaller boxes. One contains the accessories, the other contains the 3D printer. Everything fits together really well, and there are styrofoam corners to prevent the LC High-Res from bouncing around during shipping. The big, main cardboard box for the LC HR. 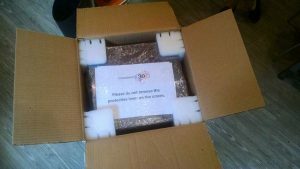 Opening up the second big cardboard box that contains the resin 3D printer. 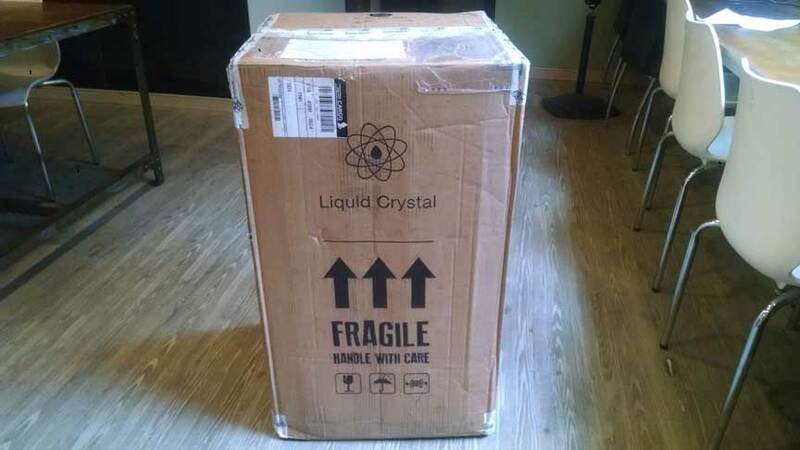 The Liquid Crystal High-Res 3D printer, with thorough packaging. Photocentric thoughtfully includes two checklists, showing that they double check their packages to make sure nothing is missing. There’s also a “QC pass” note on the touchscreen so we know that the 3D printer got a quality check before shipment. The Photocentric LC HR 3D printer comes with a short manual that describes the few steps users need to take before launching a resin 3D print. This manual has a nice, professional feel to it, and the basic instructions are clear. However, this printed version is less thorough than the online version that is available on Photocentric’s website. The aim of this leaflet is probably to be “straight to the point”– after all, it is called a Quick Guide– but we feel that it would’ve been nice to have the whole thing on paper. 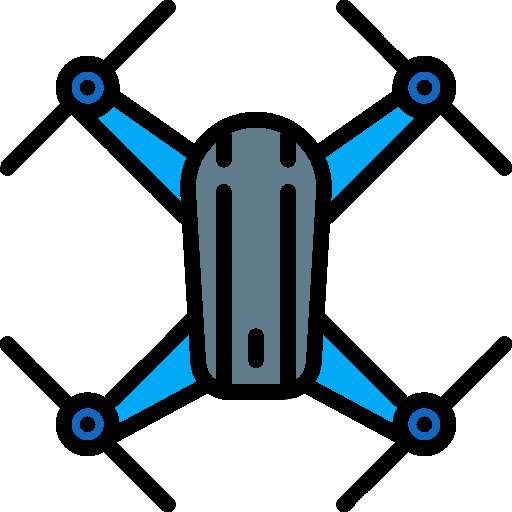 Photocentric’s YouTube videos are a great additional source of information though, and we strongly recommend watching them before unboxing. Accessories included with the Liquid Crystal HR. 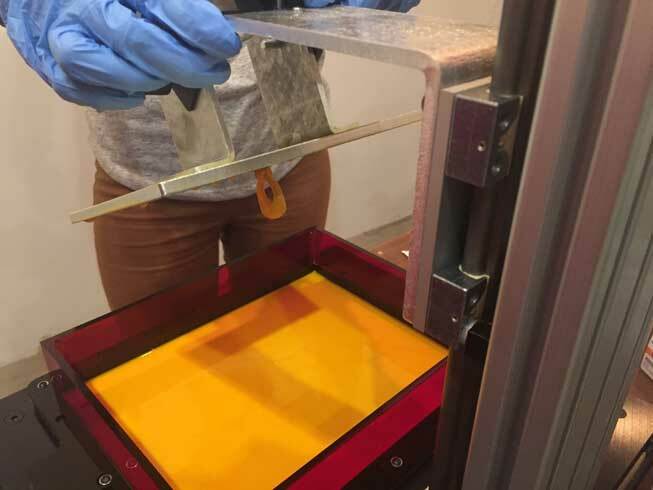 The scraper is a must during print removal, as the hardened resin is still a bit soft before the curing phase in post-processing. Therefore, touching and removing the object by hand can damage it. Actually, for one of our test ring prints we didn’t use the scraper; even while having applied very little pressure to remove it, there is a visible finger dent on the ring. The manufacturer provides a license for Envison Lab’s CreationWorkshop slicing software, which is downloadable from Photocentric’s website. The license number, required for software registration, is slightly inconveniently located on the bottom side of the somewhat heavy Liquid Crystal HR. 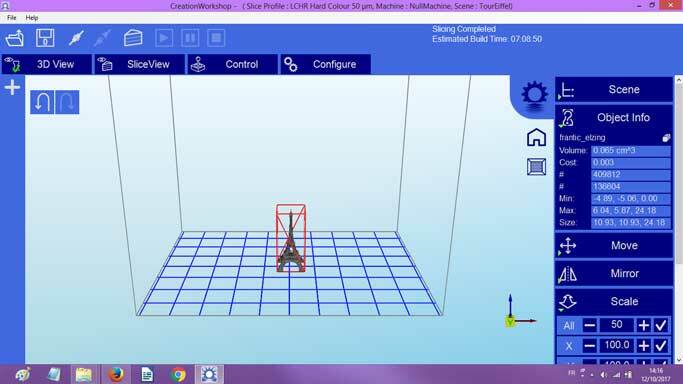 PrintFlow software for network 3D printing and the touchscreen’s interface are pretty intuitive and user-friendly. It is said to be functional on Windows, Linux and Mac, but it didn’t work on our MacBooks. A PrintFlow window opens for a few seconds and then closes by itself. We were pleasantly surprised by the large size of the Liquid Crystal HR. It’s bigger than one may expect! The black plastic design is sleek and modern– it looks and feels professional. On the base of the LC HR resin 3D printer rests a red, transparent plastic hood. This frame prevents the resin from solidifying itself with ambient daylight. A small stepper switch on the base of the 3D printer detects if the hood rests atop or not. If it isn’t, the LC HR won’t move the build platform or 3D print. The Photocentric Liquid Crystal HR 3D printer. There is a nice color touchscreen on the Liquid Crystal HR’s frontside. The colorful PrintFlow interface is user-friendly and easy to navigate. A power button for the resin-curing LCD screen is also on the frontside, along with a USB slot. If we go to the back of the 3D printer, we can see the power switch, power input jack and another USB slot for the Wi-Fi adapter. There’s also an ethernet port and a cooling fan duct. The HR doesn’t require any assembly, apart from the four base feet that need to be screwed in (we needed a wrench to do so). The build platform also requires handling, but this doesn’t really count for assembly as users have to take it off after each 3D print anyways. The Photocentric Liquid Crystal HR’s build platform. To attach the build platform onto the 3D printer’s arm, there is a big, round bolt on top of it. It must be securely screwed onto the arm. The build platform has two other bolts on the sides; these must be loosely screwed in at first to allow for homing (see below for more details). After those basic assembly steps, we can turn the 3D printer on thanks to the power switch on its backside. The LC HR takes about a minute to boot its internal system. Homing essentially means calibrating the build platform, by bringing it “home” to the LCD screen. It is comparable to bed leveling for extrusion 3D printers. For the homing procedure, we simply press a button on the touchscreen which makes the 3D printer bring down the build platform. This lays the build platform flat onto the LCD screen (which by the way has a plastic protection). After that, we just have to press hard onto one half on the platform, screw that side’s bolt tightly, and repeat for the other side. This manual step is very important, otherwise the prints won’t turn out right. It’s a bit difficult to know when the calibration is correct, as the instructions are a bit vague. Users have to press down hard on the build platform, and “white corners” should appear when doing so; but there is very little room to see that when the platform is covering the screen. To be able to fill the vat with resin, we first have to elevate the build platform by 10mm. Again, this is done simply by pressing a button on the touchscreen. Note: the 3D printer only moves the build platform if the hood is placed. To “trick” the LC HR, users can keep a finger pressed on the stepper switch, instead of repeatedly placing and removing the red hood. Only then can we pour the resin inside the vat. Photocentric recommends filling ⅓ of the vat (which doesn’t include the red, plastic walls) for most prints. Pouring resin into the LC HR’s vat. After this, the build platform must be brought back down to the base. We can choose to bring it down 10mm (since we first elevated it 10mm), or to press the homing button. This makes the liquid resin move, so we have to wait a few minutes before moving on to launching the 3D print. For our first 3D print with the Liquid Crystal High-Res, we chose the test ring file provided by Photocentric. The file is preloaded onto the 3D printer’s interface where it is easy to find. 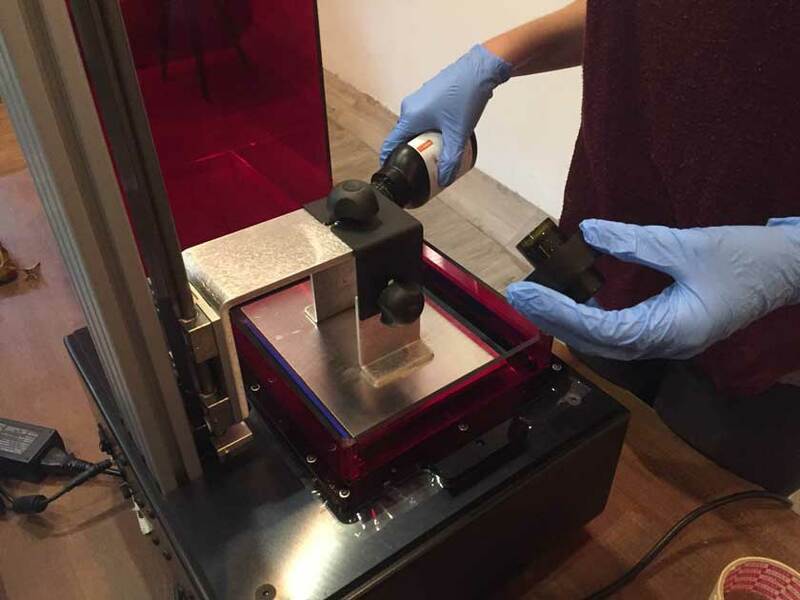 After homing and pouring the resin, we just have to press print– and it’s good to go! The LC HR takes a few moments to process the file that it is going to 3D print. It calculates how much time it will take to fully 3D print the object, and informs users on the print status and completion rate. This includes how much time it has been 3D printing, the number of the layer being printed versus the total number of layers, and how much time remains. In the beginning, the screen displays an outrageous “remaining print time” that can go up to several days for a small print. Thankfully, this calculation goes down to a pretty accurate number after about half an hour. Overall, getting started with the LC HR is pretty easy and intuitive. As mentioned earlier, the Photocentric Liquid Crystal HR comes with a CreationWorkshop license. This slicing software is more or less intuitive to use and features many different settings that users can tweak. CW can be a bit complex for 3D printing beginners, though. Photocentric mentions that Nano DLP software may work, but doesn’t provide further instructions about it. The PrintFlow software interface on the Liquid Crystal High-Resolution’s touchscreen is very user-friendly. Its menus have a modern design and are clear and simple to navigate. The LC HR’s touchscreen interface. 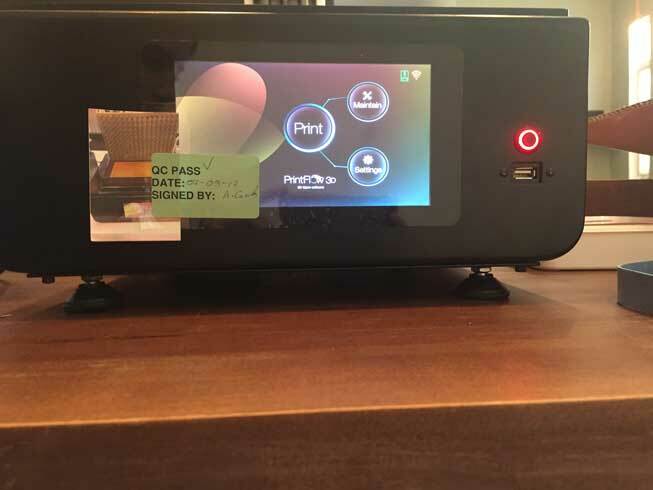 PrintFlow is also downloadable for Windows, Mac and Linux to connect to the 3D printer via Wi-Fi. We didn’t get it to work on our computer though. We thought it was a software problem, when actually the 3D printer needs to be turned on for it to operate. While it may seem logical, we didn’t think to turn on the LC HR; at the time we just wanted to take a first look at the software’s design without launching an actual print. Considering the friendly PrintFlow interface on the LC HR’s touchscreen, we can imagine that the computer version is also intuitive. Grading the 3D printing part of this review is a bit tricky. 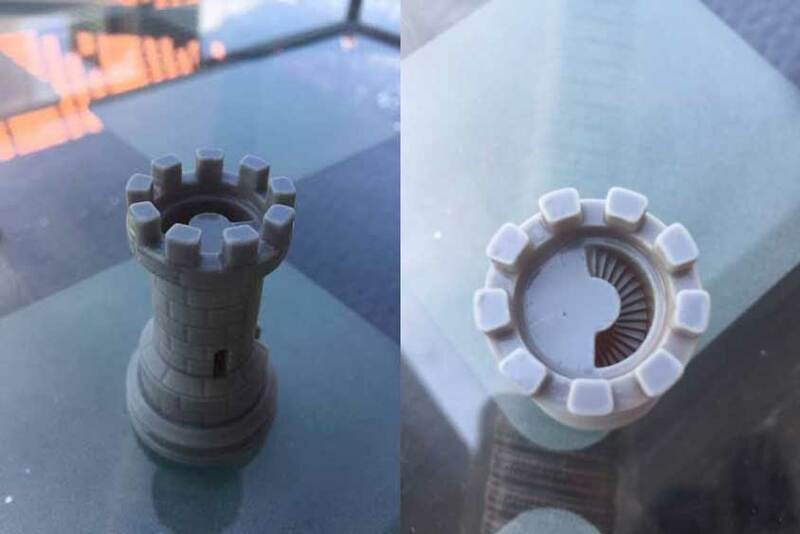 On one hand, we had difficulties getting successful 3D prints, but on the other hand we did get a very impressive result of a test chess rook. One of the problems we faced several times was the lack of adhesion to the build platform– objects just fell off mid-print. Since this printer 3D prints objects upside-down, adhesion to the build plate is critical. 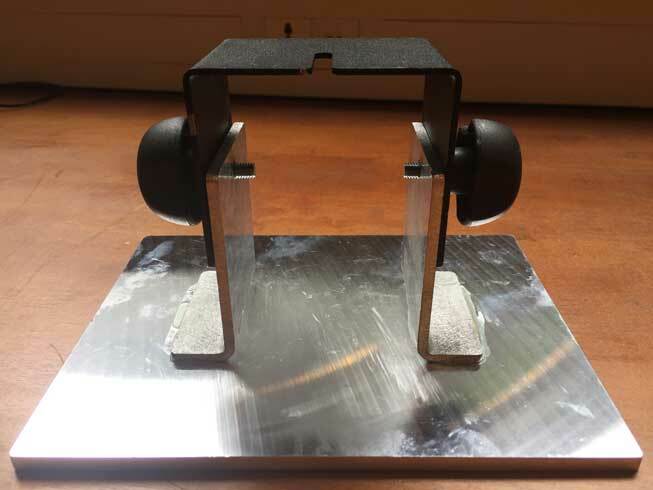 We contacted Photocentric’s technical team and they told us to sand the build platform for more adhesion. It helped a little, but we still encountered the same problem after doing so. Considering that this isn’t a cheap 3D printer kit, it is unexpected and a bit annoying to actually have to sand the build platform. Anyways, it’s definitely frustrating to see your prints fall in the vat after a few hours of 3D printing, and even more so considering all the necessary clean-up steps. As it can be seen in the photo below, one of the models we used for testing simply came out flattened (sad for an Eiffel Tower!). The manufacturer’s technical team checked the file and said it was fine, so we’re unsure of where the issue was coming from. The Eiffel Tower model came out squashed, three times. Also, as one can expect with 3D printing resins, the material has a strong, toxic chemical odor to it. We found it difficult to stay more than a dozen minutes in the same room with the LC HR while it was 3D printing. Photocentric’s safety data sheet indeed mentions various health hazards: skin irritation, allergic skin reaction, respiratory irritation and serious eye irritation. As we mention further on, we also had problems with the vat screws that quite easily stripped when we tried to unscrew them. Take off the red plastic hood, loosen the side bolts to tilt the build platform, place the frame back onto the LC HR. This is to let excess resin drip into the vat during a few minutes. Remove the red frame again, loosen the top bolt and pull out the build platform to place in on paper towels or newspaper. Quickly place the red frame back to avoid the leftover resin from hardening. Scrape off the 3D printed object with the spatula tool. Rinse the object with warm water and dishwashing soap. Same for the build platform. Place the object inside a plastic or glass container filled with soapy water. Remove the red frame again to take out the vat. Pour the leftover resin back into its bottle with the help of the funnel and a filter/strainer. Clean the vat with the help of a soft sponge and some clean paper towels. There are always small little blobs of solidified resin that stick to the vat film. Plus, resin inevitably goes into the corners and between the two plastic frames that hold the film. When you think it’s all good, there’s always more resin somewhere. It really is a pain to clean. Adjusting the build platform to let the resin drip for a few minutes. Pouring leftover resin back into the bottle. There is hardened resin residue on the vat film. The process becomes more intuitive and takes less time as users repeat it, but it’s definitely important to take it into account when planning a 3D printing session. Concerning the vat film forming the bottom of the vat (there’s no hard plastic bottom), we wouldn’t say that the system is a very efficient one. The transparent vat film holds in place with about twenty hex screws and it is meant to be replaced on a regular basis. Firstly, this means that to change the film, users have to unscrew and re-screw twenty hex screws. They are pretty tightly screwed in, and we unintentionally stripped a few of them after multiple unscrewing attempts. Photocentric sent us a second vat, and we were more careful when using the allen key to not strip any more screws. Secondly, as mentioned earlier, this system leaves room for resin leaks on the LCD screen under the vat! This is quite bothersome, as it adds another cleaning step to the already long process. To get rid of leaked resin on the LCD screen, Photocentric advises using the scraper. Users must be careful not to damage the screen, though. Resin leaks on the curing LCD screen. Resin objects require certain post-processing steps in order to find their final form. First, users must clean the object with warm water, as described earlier in the clean-up section. 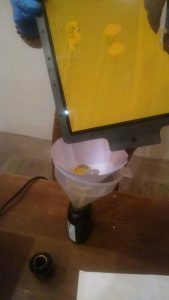 Placing the object in a water-filled container with liquid detergent, and exposing the container under light from a lamp or sunlight for 60 minutes (what we did). Placing the object in a UV unit for 30 minutes (although on their curing unit product page it says 1 to 2 hours). A UV curing unit is almost a prerequisite for professional users, as it ensures optimal resin hardening. Professionals must take into account the fact that they should buy an additional unit. Photocentric manufactures their own UV light exposure units, priced at 27£ (around 35$). We were never in the same room as the 3D printer for more than 10 minutes while it was 3D printing. In that period of time though we can still tell that the LC HR is a rather quiet 3D printer. There’s a very small noise every time the build platform moves up (to create a new layer), and a small ventilation sound. If it weren’t for the toxicity of the resin, we could perfectly spend the day next to this 3D printer and barely notice it’s working. Out of the seven 3D prints launched, only three were successful, that is to say without falling off the build platform or coming out squashed. Among those three, only one was truly good quality. The test ring is the file that is preloaded onto the 3D printer and takes about 6 hours to print. Photocentric intentionally increases the curing time per layer on this file. This may explain the lack of detail on this object’s intricacies (several holes on top of the two rings are filled). Also, the user manual recommends cleaning the objects with a soft brush or sponge, but in our case in just made the prints a bit sloppy, even when brushing lightly. Photocentric advised us to use IPA or methylated spirits, which helped a little. We wanted to test this 3D printer’s capacity to produce objects with a high level of detail by printing a model of the Eiffel Tower. Unfortunately though, after 3 tries, we never got a decent result with this object. It always turned out squashed! Photocentric’s technical team confirmed that the CWS file was fine, so it wasn’t a slicing problem. We’re still wondering what the issue is. The Eiffel Tower model came out flat. This chess rook piece, which took about ten hours to 3D print, is really impressive. We can clearly see a beautiful spiral inside the tower, and the interior staircase has an equal level of precision. We left this piece in a water-filled container out in the sun, and the resin’s usual yellow color turned grey for a few days. The color turned back to yellow after being exposed to daylight for a few days. A very successful print with the LC HR. 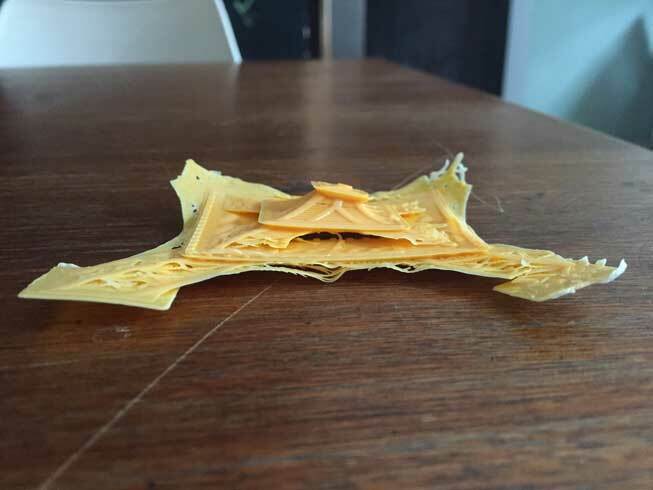 Note: our first try at 3D printing this object was unsuccessful. It didn’t stick to the build platform and seemed to have shifted layers. This is a tricky score to give, as we know that the LC HR is capable of offering very high levels of detail and precision. However, we only achieved such results once out of seven tries. With limited resin material supply, we were not able to do much tweaking and carry out more tests. We believe that this 3D printer, priced at £1,599 (about $2,100), has a lot of potential. To make the most of this potential, users need to invest some time into it. This isn’t a plug-and-play 3D printer, as its friendly, easy-to-use interface could lead one to believe. It is likely that a (possible) future version of the LC HR will boast a more optimal 3D printing experience. This is the case for example with Formlabs’ Form 2, in comparison with the Form 1. Overall, our experience with the LC HR was rather disappointing, although we are aware that the Photocentric Liquid Crystal High-Res is capable of achieving great results. 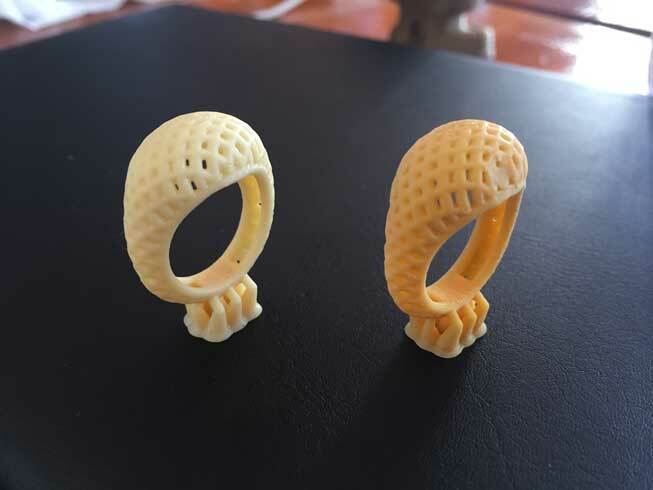 Users can obtain such results with a lot of patience, whether it be for cleaning up or preparing for various unsuccessful 3D prints. The Photocentric Liquid Crystal HR is a relatively affordable alternative to higher-end professional resin 3D printers such as the Formlabs Form 2 ($3,299). Note: the Form 2 is indeed more expensive, but the price includes a useful finishing kit for cleaning and post-processing. Plus, it uses resin cartridges, so users avoid handling bottled resin and the long clean-up process associated with it. Formlabs also manufactures specific washing units ($499) and curing units ($699). In the LC HR’s price range, we believe that there are other options either providing a higher value or a smoother 3D printing experience. For example, the Wanhao Duplicator 7 ($399) and the Peopoly Moai ($1,200) have received good general feedback from the 3D printing community. We ourselves have more experience with extrusion-type (FFF/FDM) 3D printers, and are not experts in resin 3D printing. This is our first test of a resin 3D printer, which we realize may be part of the reason why we encountered such difficulties. That being said, we watched the LC HR tutorials and read the provided instructions manual before using the machine. Furthermore, we asked Photocentric various times for tips and advice. We also kept them updated on the issues we ran into throughout the testing phase. They were relatively responsive but did not provide much actionable insight.